She Likes It, She Really Does! I ran across another article, this one by Julie Kraus at GrindTV.com, that I would like to share in part with you this month. She presents some great statistics regarding electric bikes around the world as well as her own personal experience riding one for the first time. Her story and the realizations that occur after her time in the saddle are music to my ears. Its a similar story to what we hear repeatedly from folks here at the shop. Enjoy! “Bike Europe reports that 2016 figures for European Union imports of e-bikes show a massive 60% increase compared to 2015 figures. E-bikes are not going away anytime soon. There are already 200 million pedal-assisted bikes on the roads today, and ‘Electric Bikes Worldwide Reports’ predicts that number will rise to 200 billion-yes, billion-by 2050. So maybe it’s worth at least test driving one of these smooth rides to get a sense of just how they work. I did, and upon my first boost up a neighborhood hill, a little gasp of unadulterated joy escaped from my lips. It felt a bit like riding on a witch’s broom or suddenly getting a personal jet pack. I ride bikes seriously, yet could still find the simple joy in a little pick-me-up. An e-bike will never replace my totally human-powered two-wheelers (you do still pedal an e-bike), but I was won over by the vision of having a rig for all those times when I get in my car to accomplish mundane stuff. Just think of how much more fun it would be to do some of life’s dirty work from the seat of a magic broom. But sheer joy is just one of the perks of owning an e-bike. The applications are vast for people of all ages and abilities, and even diehard cyclists, who typically wouldn’t touch an electric bike with a 10-foot pole, might be surprised by e-bikes’ tangible benefits. *It can equal the playing field for couples with different riding abilities. So, here it is again… the good news story about the growing electric bike movement. Come join the two-wheeled revolution! 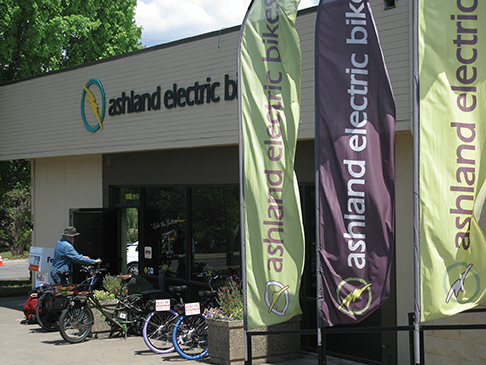 http://ashland.oregon.localsguide.com/wp-content/uploads/2016/05/2016_June_AshlandElectricBikes2.png 365 486 Ashland Electric Bikes http://ashland.oregon.localsguide.com/wp-content/uploads/2018/05/logo-1-300x76.png Ashland Electric Bikes2017-06-29 10:35:272017-06-29 10:35:27She Likes It, She Really Does! Our goal at Ashland Electric Bikes is to offer high quality electric bikes that provide excellent performance and the highest level of customer satisfaction. Our bikes are designed and built to last year after year, long into the curious and exciting future that awaits us all. We are at a very exciting point in time on planet Earth. The collective decisions humanity makes in the next few years will have profound implications far into the future. Issues of sustainability and environmental impact are demanding our full attention. Transportation, and the burning of fossil fuels must be revisited at every level. Ebikes play an integral role in re-envisioning the way we all literally 'move in the world'. In these dynamic, changing times it is up to each and every one of us to do our part to co-create a healthy, sustainable future for ourselves and generations to come. At Ashland Electric Bikes we gain great pleasure knowing that we're helping 'green up' the world...one bike at a time! Just Do It – It’s Good For You! Ashland Electric Bikes Eco-Friendly & Fun to Ride! Electric Bikes ARE NOT Cheating! Are You the Next Captain of this Ship?